As proud Canadians, around 30,000 Romanian speaking people are living in The Greater Toronto Area. University professors, teachers, doctors, nurses, politicians, computer specialists, architects, engineers, business managers, store and restaurant owners, office clerks, accountants, real estate agents, insurance brokers, geologists, ballet instructors, choreographers, sculptors, iconographers, musicians, athletes, skilled and trade professionals or in any other qualified or unqualified jobs the Romanians contribute to the development of a peaceful, prosper and friendly Canadian society. Romania is located on the lower Danube River in southeastern Europe, in the Balkan Peninsula. It has a geographical area of 237,500 square km and a population of approximately 21,000.000. In 1992 , 89.1 percent of the population were estimated to be ethnic Romanians, 8.9 percent were ethnic Hungarians, and 0.4 percent were Germans. The Hungarian and German minorities are concentrated in Transylvania, a province in the middle of the country. Dacian tribes living in what is now Romania were defeated by the Roman emperor Trajan in 106 AD, and for the next 165 years the country was the Roman province of Dacia. During that time the native population was Romanized and the Romanian language developed from spoken Latin and Dacian. A new nation was born: The Romanians. At the beginning they were organized in three provinces: Transylvania, Walachia and Moldavia. Hungarians settled in Transylvania in the 11 -th century. Germans (sasii) settled in south-eastern Transylvania in the 12 century. The Ottoman Turks established control over Walachia and Moldavia in the 15-th century, despite fierce resistance by Romanian princes. In the last decade of the 16-th century MICHAEL THE BRAVE, Prince of Walachia, defeated the Turks and briefly united Walachia with Moldavia and Transylvania (1600 AD). After that Transylvania went back to the Austro-Hungarian Empire and Phanariot Greeks were appointed by the Turks to govern Moldavia and Walachia. In 1859 Alexandru Ioan Cuza was elected voivode of both principalities, Moldavia and Walachia, and in 1862 the powers recognized the administrative union of the two states as Romania. Cuza carried out many sociopolitical reforms. In 1866 he was forced to abdicate and was replace by Prince Charles of Hohenzollern-Sigmaringen, who led Romania in its War of Independence (1877-1878). In 1881, Charles was crowned King Carol I of Romania. During the next 35 years Romania gradually modernized. Foreign policy aimed at the unification of all the Romanian lands. Carol I was succeeded by his nephew Ferdinand in 1914. In 1916 Romania entered World War I against the Central Powers. Despite initial defeat and the occupation of the country by Austro-German forces, the Allied victory enabled Romania to acquire the former Austro-Hungarian territories of Transylvania, Bucovina and Banat (December 1, 1918). This, in addition to Bessarabia, taken from the disintegrating Russian Empire, doubled the size of the Romanian kingdom (March 27 ,1919). In 1938, King Carol II established a royal dictatorship that lasted until 1940. That same year Romania was forced to cede Bessarabia and Bucovina to the USSR, northern Transylvania to Hungary, and southern Dobruja to Bulgaria. Under Gen.Ion Antonescu Romania participated in the German-led invasion of USSR. Faced with imminent defeat by the advancing Red Army, King Michael, the army, the three traditional parties , and the minuscule but well-organized Communist party overthrew Antonescu in August 1944. Romania then joined the Allies but still lost Bessarabia to the USSR in the postwar territorial settlement. In December 1947 the monarchy was abolished and Romania was proclaimed a people's republic. Under Communist leader Gheorghe Gheorghiu-Dej industry was nationalized, agriculture was collectivized and political opposition was suppressed. In 1965, Nicolae Ceausescu succeeded Gheorghiu-Dej and his regime was discredited by its abuse of human rights and economic mismanagement. In December 1989, in a brief but violent revolution the regime was overthrown and the dictator and his wife were executed. A coalition including former dissidents, Communist party members and army officers, calling itself the National Salvation Front took over. Its leader Ion Iliescu became the president of Romania. After 1996 through free elections a democratic government was elected and a new era began under the leadership of president Emil Constantinescu. Romanian, an eastern Romance Language, is the official language. Hungarian is used by the Hungarian minority, and German and other languages by the relevant minorities. Most Romanians adhere to the Romanian Orthodox Church. Roman-catholic , Lutheranism, Unitarian, Calvinist, New-Protestant, Eastern Rite Catholic are among the German, Hungarian or other minorities. The decorative folk-art tradition, with its colorful geometric motifs expressed in wood/stone carvings, textiles, pottery, and architecture remains the quintessential Romanian style. World known artists include: Nicolae Grigorescu, Teodor Aman, Stefan Luchian and Nicolae Tonitza (painters); Constantin Brancusi (sculptor); George Enescu (the founder of the modern school of Romanian music). Written Romanian literature is paralleled by a rich folklore - lyric, epic, dramatic, and didactic - which continued till moderns times. Lyrical poetry is represented by doine (love songs), bocete (dirges), colinde (carols), and cantece (lyrics); the epic by ballads in verse and folk tales in prose; and drama by mystery plays, scenes of the Nativity (Vicleim, Irozi), new year plays (Plugusor). The didactic literature is rich in proverbs, riddles, and satiric songs. World - known writers include: Mihai Eminescu, George Cosbuc, Vasile Alecsandri, ,Lucian Blaga, Nichita Stanescu - poets; Ion Creanga, Mihail Sadoveanu, Liviu Rebreanu - novelists; Ion Luca Caragiale, Eugen Lovinescu - play writers. Romanian Cuisine includes a number of spicy dishes, including pork, chicken, and smoke sausage accompanied by mamaliga (corn meal cooked until firm). Typical dishes are sarmalute in foi de vita (ground meat wrapped in vine leaves and served with yogurt or sour cream), sarmale (ground meat wrapped in cabbage leaves), pui la ceaun (chicken cooked in a garlic sauce), mititei (homemade Romanian sausages) and ghiveci calugaresc (vegetables cooked in oil). Desserts include cheese pancakes, crepes and plum pudding. Popular alcoholic drinks are tuica (plum brandy), mastika (grape brandy), rachiu (brandy made from a mixture of fruits) and wine. Romanians began arriving in Canada in the last quarter of the 19-th century. Most of them were coming from the provinces of Transylvania and Bukovina which belonged until 1918, to the Austro-Hungarian Empire. They first settled in the prairie provinces and Quebec. More Romanians immigrated to Canada in the 1920's. A large group of refugees arrived following the Second World War, settling primarily in Ontario and Quebec. Included among the first Romanian settlers in Toronto, were officers and army personnel who were in German camps after the World War II and others who escaped from Romania's new Communist regime. They found jobs as farmers, tailors, gardeners, cleaners and in meat slaughter houses. (many of them being highly educated). One of the first organizations were The Romanian Cultural Society on Dewson St., formed to help newcomers find employment. This organization edited "Tribuna Romana", a newspaper published for a period of three years. Cultural events were held at an Ukrainian Church Hall, on Bathurst Street. After the Second World War more Romanians immigrated to Canada and settled in Toronto. They brought with them their culture, traditions and beliefs. By 1953, those already established in Toronto, members of The Romanian-Canadian Cultural Association, started to plan the creation of a Romanian Orthodox Church in their new hometown.It seemed a hopeless undertaking. They had no money, no building, and there was no priest who could conduct services in their own language. 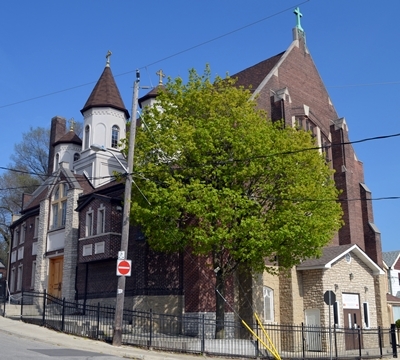 On March 14th,1954 members of the small Romanian-Canadian community in Toronto founded their first Orthodox Parish, by buying a building on 324 Broadview Ave., where their religious and cultural activities could take place. The members of the newly created Church Community chose the Holy Great Martyr George, the Victory-Bearer and Wonder-Worker, as their patron-saint. On May 16th,1954 Nicolae Zelea, a young theologian from Hamilton, was elected to be the first priest of the Saint George Romanian Orthodox Church of Toronto. Born on January 8th, 1916 in Boian, and graduated at the Faculty of Theology in Cernauti, then both part of Romania, he was ordained priest on June 20th ,1954, in Montreal. The church's first Liturgical Service was held by the newly priest on June 27th, 1954. Lots of Romanians participated at this service being overwhelmed by the emotion and happiness that their dream came true. On October 29th, 1954, Saint George Church was registered under the jurisdiction of His Eminence Archbishop Valerian of the Romanian Orthodox Episcopate of America from "Vatra Romaneasca", Detroit, USA. The Romanian Community continued to develop every year. New members joined it and the books showed a much better financial situation. 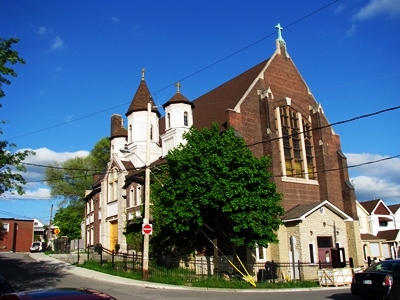 As a result, on July 1st, 1970 the Saint George Parish decided to buy another building, a former Anglican Church on 247 Rosethorn Ave., which was decorated in a traditional Orthodox style. On April 23-24th, 1971, during the celebration of Saint George, the patron of the parish, His Eminence Archbishop Valerian gave his blessings to the new church building and its parish members. At age 65, Father Nicolae Zelea retired on February 1st, 1981 after 26 years of devotion to God and to the Romanian Orthodox community in Toronto. Later on, for all his merits demonstrated over the years, he was elevated to the rank of Archpriest in 1991 by His Eminence Archbishop Nathaniel from "Vatra Romaneasca". After Father Zelea's retirement in 1981, until 1990, the Saint George Romanian Orthodox Parish in Toronto was served by several priests. However, none of them became permanent for this parish. In chronological order they were Father Nicolae Tanase (1981-1983), Father Sterie Mihadas (1983-1986 and 1989-1990) and Father Mihai Handrabur (1986-1989). During this time, even though there were so many changes, the parish kept its candle alive and it continuously developed. On May 13th 1990, the Parish Council concluded the selection of a permanent priest. On June 10th, 1990, the Parish General Assembly elected Father Ioan Bunea from Hamilton . He was born on January 1st 1955, in the city of Victoria, Brasov, Romania, and graduated the Faculty of Theology in Sibiu, also in Romania. This represents the beginning of a new and flourishing period in the history of the Saint George Romanian Orthodox Church in Toronto. During the last 20 years this church was fully renovated and re-decorated, becoming a beautiful sample of a traditional Romanian orthodox church. The building was decorated with mural orthodox icons in Byzantine style, the Romanian iconographer Nicolae Enachi hand-painting the entire interior between the years of 1997 and 1999. The new iconostasis, designed by Father Ioan Bunea, was handcrafted in oak by a group of sculptors from the Neamt County, Romania, coordinated by Mihai Croitoriu. The icons on the iconostasis were painted by Marian Verza, a religious artist from Sibiu, Romania. The installation of the new iconostasis was finalized at the end of 2002. The parish hall, known as the Romanian Cultural Centre "Dacia", was also fully renovated with volunteer work under the supervision and guide of father Ioan Bunea and Dan Chirtu. In 2004, the Saint George Romanian Orthodox Church in Toronto celebrated its 50th Anniversary with blessings from Archbishop Nathaniel, Bishpop Irineu Archbishop Nicolai and many priest. After that a new addition to the north side of the Church's building was completed, with three towers in the orthodox tradition, an elevator for the elderly and challenge persons, with granite flors for the hallways, modern washrooms, a classroom for Sunday School and a future Chapel. All this were possible at the initiative, ideas and supervision of father Ioan Bunea, with great help from all parishioniers by donations or volunteer work guided by Ioan Haba and Petru Dalea. The religious activity of the Saint George Romanian Orthodox Parish in Toronto was accompanied through the years by numerous social and cultural events prepared by several organizations created within the parish. Here is the list of these organizations and the years they were founded: The Ladies Reunion founded in 1963, The Romanian Cultural Association "Dacia" created in 1972, The Sunday School created in 1990 and The Seniors Association founded in 1992. Over the years the Saint George Romanian Orthodox Parish in Toronto was visited by important guests from Romania, Europe and North America. We name here just a few of them: His Eminence Archbishop Valerian - Vatra Romaneasca, His Eminence Archbishop Nathaniel, His Grace Bishop Irineu, His Eminence Metropolitan Iosif - Western Europe, His Majesty Michael I - King of Romania, Her Majesty Ileana - Princess of Romania (who later became a nun known as Sister Alexandra), Aron Cotrus - Romanian poet from Transilvania, Ronald Michener - President of the Federal Parliament of Canada (who later became the Governor General of Canada) as well as Nathan Phillips - Mayor of Toronto, and Honourable Alan Tonks MP, Parliament of Canada. Today, St. George is Toronto's largest Romanian Church. The Church is the focal point of religious and cultural activities for the community's 30,000 romanians. Parish Priest: Very Rev. Fr. Ioan Bunea - office tel. 905-770-8529. It operates a library. Sunday School courses, and banquets are held celebrating various religious or national holidays. On January 24, the Union of Principalities of 1859 is celebrated. It was the day Muntenia and Moldova were united to form the single state of Romania with Bucharest as the capital city. Special church services are held with a program to recall Romanian history and its present state in world affairs. Poems are recited as part of the celebration, along with songs and folk dancing. Bessarabia and Bucovina Day on March 27 commemorates the 1919 reunification of Bessarabia and Bucovina with Romania. Religious and community programs are held with dances and poetry recital. May 10, Independence Day, honours the day in 1877 that Romania gained its independence from the Ottoman Empire. Celebrations are held on the nearest weekend, with religious services, speeches, dances and cultural programs. Martyrs' Day is held the Thursday before Ascension Day or 40 days after Easter. A religious and national ceremony takes place at the martyrs' cross on the Romanian camp grounds near Hamilton. Every summer, there is a week-long Romanian camp featuring literature and cultural seminars in addition to recreational activities. It is held at the Romanian camp retreat near Hamilton and is organized by the Romanian Cultural Association "Nae Ionescu" of Hamilton. St. Mary's Chapel is located on the campgrounds along with a modern pavilion with a hall, library and meeting rooms. In September, after the Labour Day Weekend, The Romanian Festival draws Romanians from across North America and Ontario at Mel Lastman Square in Toronto. Cultural and religious programs on December 1-st celebrate the Union of Transylvania with Romania. It is the National Day of Romania. Christmas celebrations include a children's Christmas party, and Colinda, a celebration in which carollers dressed in traditional Romanian costumes carry a star decorated with the Nativity scene and share good cheer with their neighbors.